- NEW Version 2.0 features complete site redesign for faster loading. - Feel free to LINK to this page. - Please DO NOT copy this walkthrough to any other site. - Please do not email me for specific hints. Everything you need to know is here. Welcome to Sinjin's first walkthrough of the new millenium. Grab your hat and your whip and get ready for some intense action and adventure with the uncontested "king of adventure", Indiana Jones. You will guide Indy across 17 massive levels as you collect the elusive parts to complete the mysterious Infernal Machine. This walkthrough is different from my others. Aside from being my first strategy guide on a "white background", I am making a large selection of screenshots available with the text. Hopefully by using these pictures I can use less descriptive text and the solve will be less confusing when trying to find your bearings. Navigating the walkthrough is easy and fast. The menu on the left will instantly take you to any of the 17 levels in the game. Each of the level menus are unique and have additional "hot-zones". You can click on the numbers at the bottom to instantly locate each of the level's ten treasures. 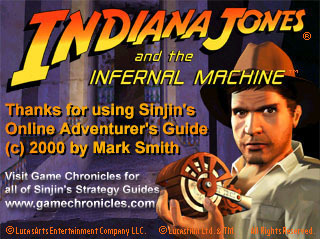 Clicking on the Indy Logo at the top of the menu will always scroll you to the top of your current page and new for version 2.0 - clicking on the Red Treasure X at the bottom of the menu will let you download a copy of Sinjin's Save Game for that level. Note: All of Sinjin's saved games include ALL treasures and Perfect IQ scores. 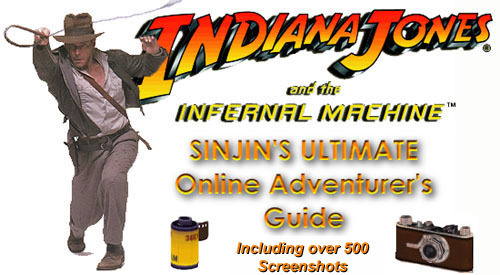 Sinjin is here to guide you through the entire adventure. You can use this solve to help you through the harder areas or to solve the entire game. Use the handy Treasure Location Links at the bottom of each menu to locate each of the ten treasures on each level. But before we begin, let's get acquainted with the 3D world of Indiana Jones. Indy's world is much like our own and there is danger lurking above as well as below. Make sure to use the LOOK command to survey your surroundings before planning your next move. It may just save your life. There are med kits and anti-venom potions and other useful items scattered all over the place. Most of these are in plain sight and I will often not take the time to mention them in the text. As long as you are observant you should be able to find plenty of supplies to keep you alive throughout the adventure. Remember to search the bodies of ALL guards you kill. You will often get ammo and sometimes even a new weapon. Finding ammo is much better than having to buy it at the Adventure Outpost. Stay Healthy. This may sound obvious but it is very easy to overlook your damage meter. I always try to keep some green in it. At the hardest skill level it only takes a few enemy bullets to put you down. Med kits are plentiful so use them. They won't keep you alive sitting in your backpack. Each level has ten treasures that you should always be looking for. Treasure isn't required to win the game, but collecting it increases your IQ points and gives you money necessary to buy supplies for your adventure. The Treasure Location Index at the bottom of each menu shows the location of all the treasure on each level. If you hold the mouse over any treasure number the item name will be displayed in the status bar of your browser. The Adventure Outpost is a supply store you can visit between missions to stock up on ammo, med kits, anti-venom, and anything else you think you might need. Feel free to purchase as much or as little as you think you might need. I will be telling you what I purchased during each of my visits to the Adventure Outpost. While your pistol makes an adequate weapon against the smaller enemies in this game (like snakes and scorpions), you will probably want to upgrade as soon as possible. Here are the weapons you will find in your adventure. As long as you keep your hands out of your pockets; you get these weapons at no charge. Unlimited ammo too. Another freebie with unlimited ammo. You can also use to disarm opponents, solve puzzles, climb, and swing across gaps. This is a true multi-purpose tool. This close-range weapon is great for clearing obstructions like bamboo, leaves, soldiers, etc. It is also the only weapon you can use while swimming underwater. Indy begins the game with this standard issue handgun. It is good for short to medium range combat and has unlimited ammo. This Soviet weapon provides rapid fire and is effective at most ranges of combat. Based on a German design, this automatic pistol has an incredible range and is easily the best handgun in the game. This weapon provides long-range combat potential. Great for taking out the enemy before they can even shoot back. This short-range weapon delivers a powerful punch to nearby enemies. A single shot will take down most mortal opponents. Definitely the most destructive weapon in the game, but only effective at long-range. Not for indoor use. These explosive devices are on a short timer so once you set one, get away fast! You can also put them in the path of your enemy as they are also triggered when enemies step on them or drive over them. These small explosive grenades do more damage than you think. Make sure to back off after throwing them or you could get caught in the backwash. Great for lobbing onto enemies below your position. You will encounter a wide assortment of enemies during your adventure. While most of these are your typical Communist spies, soldiers, commandos, etc., you will also encounter other less-intelligent foes. Do not under-estimate them as they can be just as deadly. These creatures look like mini-alligators but they are very fast and very dangerous. They take about 3-4 bullets to put down so start shooting as soon as they are in range. You will soon learn to refer to these creatures as "road kill". Run them over with your jeep and leave them lying in the desert for the vultures. You can't kill these animals but they are easily frightened by gunfire. These huge rock-like creatures are found in the depths of the volcano levels. They cannot be harmed by normal weapons, but they are also very slow which makes them easy to avoid. Their best advantage is surprise as they blend into the walls perfectly. The Urgon Part will destroy these creatures if you get close enough to use it, but the risk is usually too great. They are fast and deadly and can kill you quickly if they gang-up on you. Use your machete or better yet - get out of the water. They can be shot from the shore with regular weapons if they are close enough. Just as poisonous as the spiders and even quicker. Also easily killed with your pistol. Always try to avoid this extremely deadly creature. If you must fight, use your machete and save your game. We know how Indy feels about snakes. Keep your distance as these guys can lunge at you. Kill them with multiple shots from your pistol. These poisonous creatures are fast and elusive but you should be able to kill them with your pistol or whip. If you see spider webs, chances are a spider is nearby. Watch for the ones that drop from the ceiling. Another animal that cannot be killed. Fire your pistol to frighten them off. The following cheat codes have been tested and are known to work. Codes are CASE SENSATIVE so you must use all-caps and include the _ when shown. You must press F10 to activate the console mode to enter these cheats.